K File 15-40 no 21 mm MANI - Extraordinarily sharp and mirror-like finish cutting edges make possible for excellent working characteristics with high ductility. MANI Original 18-8 hard fiber stainless steel prevents corrosion after repeated cleaning and sterilization. Extraordinarily sharp and mirror-like finish cutting edges make possible for excellent working characteristics with high ductility. MANI Original 18-8 hard fiber stainless steel prevents corrosion after repeated cleaning and sterilization. K File 10 no 25 mm MANI - Extraordinarily sharp and mirror-like finish cutting edges make possible for excellent working characteristics with high ductility. MANI Original 18-8 hard fiber stainless steel prevents corrosion after repeated cleaning and sterilization. K File 10 no 21 mm MANI - Extraordinarily sharp and mirror-like finish cutting edges make possible for excellent working characteristics with high ductility. MANI Original 18-8 hard fiber stainless steel prevents corrosion after repeated cleaning and sterilization. Tweezer Pick up small objects with precision, using this unique “cotton and dressing tweezer, commonly used by dentists to place cotton rolls between the cheek and gum. 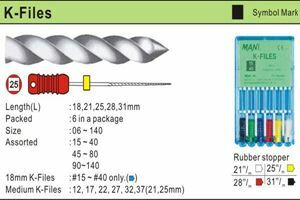 K File 15-40 no 25 mm MANI - Extraordinarily sharp and mirror-like finish cutting edges make possible for excellent working characteristics with high ductility. MANI Original 18-8 hard fiber stainless steel prevents corrosion after repeated cleaning and sterilization. K File 45-80 no 25 mm MANI - Extraordinarily sharp and mirror-like finish cutting edges make possible for excellent working characteristics with high ductility. MANI Original 18-8 hard fiber stainless steel prevents corrosion after repeated cleaning and sterilization. K File 15 no 21 mm MANI - Extraordinarily sharp and mirror-like finish cutting edges make possible for excellent working characteristics with high ductility. MANI Original 18-8 hard fiber stainless steel prevents corrosion after repeated cleaning and sterilization. K File 20 no 21 mm MANI - Extraordinarily sharp and mirror-like finish cutting edges make possible for excellent working characteristics with high ductility. MANI Original 18-8 hard fiber stainless steel prevents corrosion after repeated cleaning and sterilization. K File 15 no 25 mm MANI - Extraordinarily sharp and mirror-like finish cutting edges make possible for excellent working characteristics with high ductility. MANI Original 18-8 hard fiber stainless steel prevents corrosion after repeated cleaning and sterilization. Kidney tray is used in medical and surgical wards to receive soiled dressings and other medical waste. K File 20 no 25 mm MANI - Extraordinarily sharp and mirror-like finish cutting edges make possible for excellent working characteristics with high ductility. 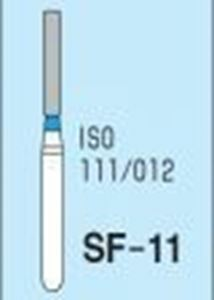 MANI Original 18-8 hard fiber stainless steel prevents corrosion after repeated cleaning and sterilization.